Loch Carron Flame Shell © SNH Flickr. 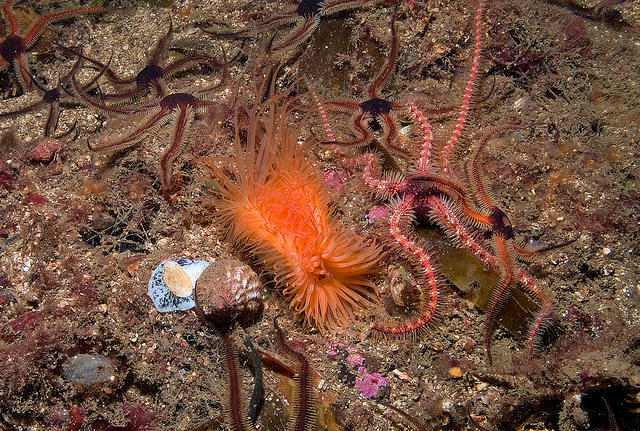 Last week we continued a serial feature from Open Seas, which showcased a few of Scotland’s crucially important seafloor species, their history in Scotland’s seas, and what the future may hold. 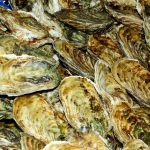 Native oysters, horse, fan and blue mussels, serpulid reefs, flame shells, seagrass, maerl, gravels with burrowing sea cucumbers, cold water corals and Scotland’s seafan and sponge communities each play a key role in our seas. Telling their story gives an insight into the history of our seas more generally – and hopefully inspires us to think about where we can go in the future. Welcome to Part 4: Flame Shell Beds. Flame shells are small, cockle-like shells. Their stunning red tentacles emerge from their shell and flow in the passing currents like flames (hence the name). However, their colour is not the most remarkable thing about them. Far more amazing is the fact that these tiny shellfish build and live in huge nests on the seafloor. Once flame shells mature and settle on the seabed, they gather together and set about building a submarine home. Each tiny shellfish swims around looking for shells and gravels which they collect in their tentacles and bring back to their chosen underwater home, before glueing them together into a nest using a kind of mucus they excrete. When hundreds of these engineering little shells congregate and build their little nests next to each other, the seabed becomes a network of flame shell warrens. The network of nests is a rich part of our sea, important for juvenile and spawning scallops, as well as for foraging opportunities by young fish, crabs and other shellfish. Knowledge of historical and current flame shell beds is incomplete, in part because when they are in their nests, their colourful tentacles are hidden making them difficult to spot. However, recent studies indicate that they have been lost from their former widespread distribution, including in the Clyde and around the Isle of Man. Several areas around the Mull of Kintyre are believed to have been lost in the 1980s, and an area of flame shell reef near Loch Sween, in the Sound of Jura was confirmed as locally extinct during a 1985 survey. Scallop dredging is widely accepted to be the cause for such declines and recovery from such events is understood to take decades. Unfortunately, these damaging events are not just in the past; part of the Loch Carron flame shell bed was dredged over in April of 2017, devastating the reef in its path. Thanks to recreational divers in the area being able to get into the site and record the devastation caused by this dredger, the incident received national attention and the Scottish Environment Minister, Roseanna Cunningham MSP, pledged to immediately protect what remained of the reef. Hopefully this will mean we don’t have to bear witness to another such event, but somewhat incredibly, the move was condemned by some trawl and dredge fishermen. Fortunately others have pledged to take positive and voluntary steps. However, it is unclear whether these actually came to fruition. Flame shells like coastal waters where currents are strong and so they remain mostly at the mouths of a handful of sea lochs around the west coast. As well as Loch Carron, beds can be found in Loch Sunart, near Otter Ferry in Loch Fyne, and in a few remnant patches near Ullapool, Lismore and Rum. In truth, however, we really do not know their true extent. In 2012, researchers from Heriot-Watt University found what they determined at the time to be the world’s largest flame shell reef right under the Skye bridge, a reef that was previously completely unknown. Amazingly, just 5 years later, and only following the surveys undertaken to assess the scale of damage caused by the dredger in Loch Carron, researchers have now concluded that the reef there, previously thought to be patchy and small, is now actually the largest in the world! Clearly there is lots we do not know about the extent of this important part of our marine ecosystem. In our view that’s all the more reason to take a precautionary approach to protecting them! 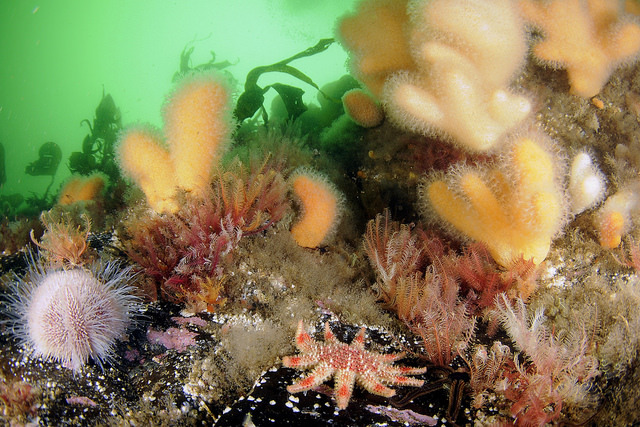 Scottish Government recently concluded a consultation looking into whether they should protect this species in Loch Carron, we hope to see them securing the reefs in this area, and others like it, for the long term good of our seas. This piece forms part of a series of articles Stories from Scotland’s Seabed from Open Seas.